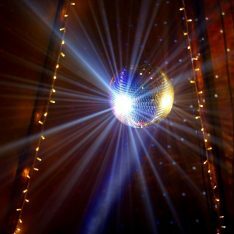 Home » Blog » How much can you handle…? A new job, house move and marriage all within a matter of months might phase most of us but not Cheryl and Adam! They clearly must be organised to have achieved all of this, especially with a little one to throw into the mix! 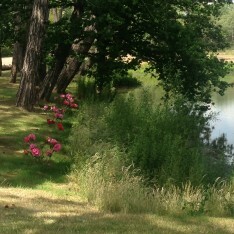 It was another gorgeous day, the summer flowers were in bloom by the lake and we were soaking up the sun while waiting to meet the suppliers. Nothing out of the ordinary so far but there was one supplier that we were particularly keen to meet… ‘The Purple Blackcurrant‘ who were delivering the wedding cake. We’ve seen quite a few of these now but we’d had a tip off that this cake was a little different from the norm…. 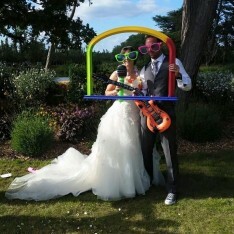 Cheryl and Adam wanted a festival vibe running through their celebration and they hoped their choice of cake would reflect this. 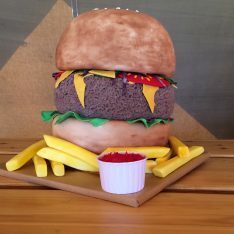 We watched as it was carefully unpacked and the big reveal was a HUGE burger and fries creation that immediately made us hungry – although we weren’t quite sure whether it was for a burger or some cake! 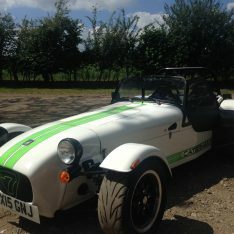 The day began with Adam being chauffeured to the farm by his best man in a caterham. You can always rely on a stylish little sports car to get the wow factor so Adam’s arrival certainly ticked that box. 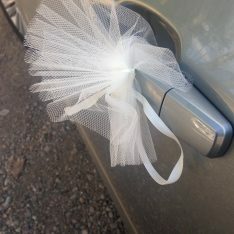 Cheryl soon arrived in a wedding car that had not only been decorated with the traditional ribbon but there were also some lovely decs on the door handles – a nice finishing touch which meant that whichever angle you viewed the car from, you knew something special was going on. Adam had a smart grey 3 piece with a crisp white shirt, coordinating cravat and a pair of Converse. Cheryl’s dress had silk straps, fitted sweetheart bodice, beautiful taupe ribbon around the waist and intricate lace detailing layered over the body of her dress. They both looked fantastic and captured the finesse that a wedding deserves while also allowing their own style to shine through. Having your wedding on a working arable farm means that sometimes you catch a glimpse of the agricultural operation in full swing. 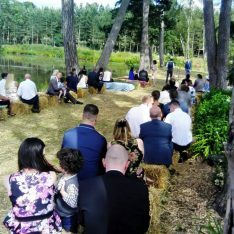 It was a sunny June day and Adam and Cheryl’s wedding fell slap bang in the middle of our hay making which meant their guests were able to witness the baling taking place as they arrived – not your run of the mill entertainment but one that seemed popular nonetheless. 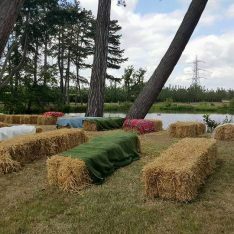 Adam and Cheryl opted for a blessing by the lake and seated their guests on bales which added to the relaxed and rustic theme. 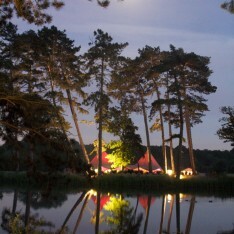 There was then time for everyone to relax and enjoy the beautiful surroundings. 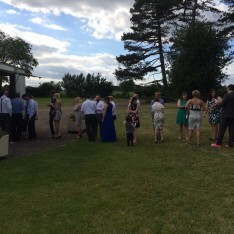 Guests chatted and soaked up the feeling of countryside calm, the open air photo booth received a visit from the special couple and the kids made the most of the lawn games and the opportunity to wear out the dads with a spot of cricket (or was it the other way round?!). 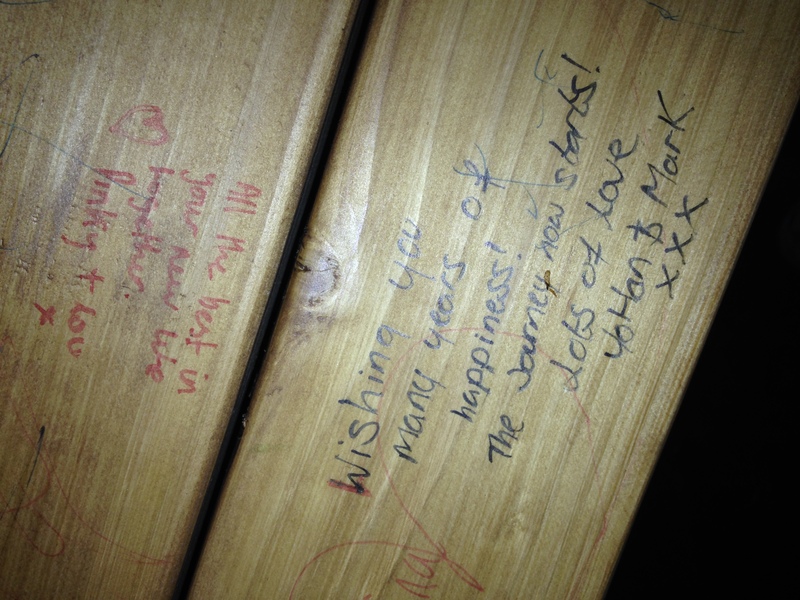 Something else keeping the guests busy was writing their special messages in the guestbook (scrub that) bench. We always like to pop on site when people are preparing for their wedding day to check all is ok and when we came across Adam he had his drill out and was building a bench. I’m not sure if we looked confused or he just felt it best to explain that he was building a bench for their guests to sign instead of the traditional guestbook. He explained that they had planned to put it in their garden but with their house move they’d have a bigger kitchen so it might be able to go in there. 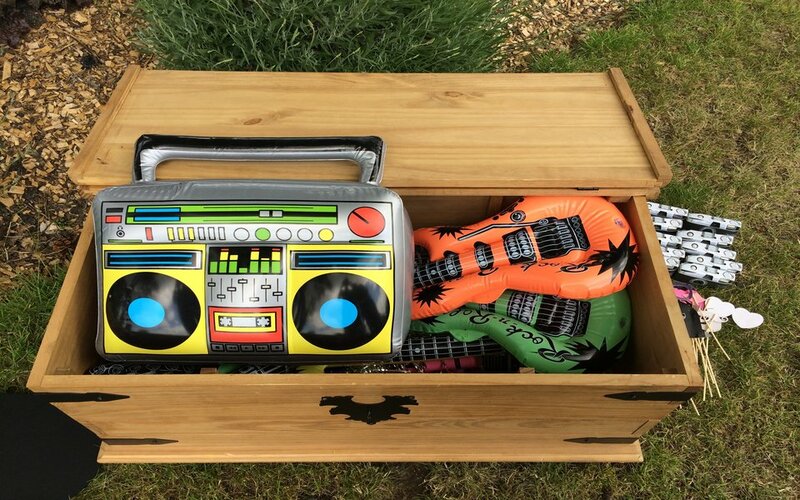 Wherever they put it we think it is an absolutely fantastic idea! Often guestbooks get put away, probably somewhere safe, but although it’s safe its soon forgotten and rarely looked at. Having your ‘guestbook’ as a piece of your furniture is pure genius meaning those happy memories and messages are at your fingertips every single day of your married life reminding you what it’s all about. 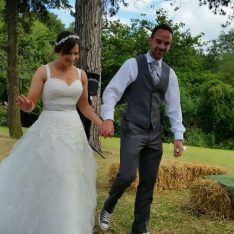 Food is an important part of any celebration and Adam & Cheryl had chosen a quintessentially English meal with a festival twist. A food station in the form of The Frying Squad set up and it wasn’t long before the unmistakeable smell of fish and chips began to drift towards the guests. They opened up their serving hatch and Adam and Cheryl kicked it all off being served the first portions of fish and chips with a queue of guests behind them eagerly awaiting their dinner. 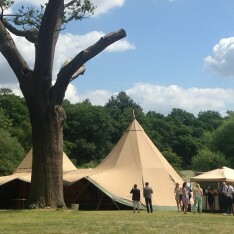 It was a beautiful day and a lot of time was spent outside but when the temperature dropped and it was time to dance everyone headed into the tipi, something that had been part of the backdrop and set the atmosphere for Adam and Cheryl’s festival feel wedding.